John Purroy Mitchel died one hundred years ago today. 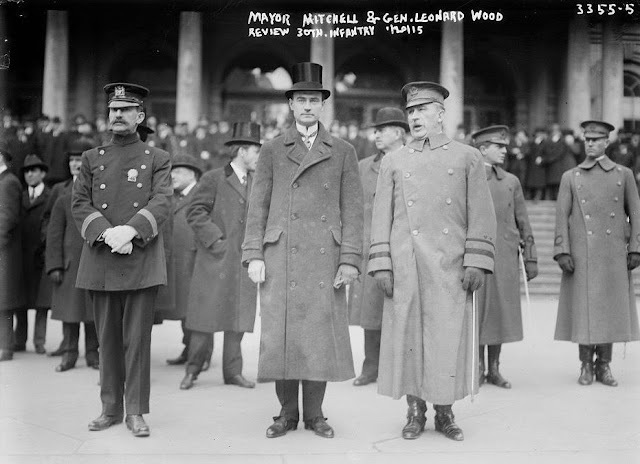 Mitchel served as mayor of New York City from 1 January 1914 to 1 January 1918 and joined what became the Army Air Service days after leaving office. He was killed in a flight training exercise in Louisiana on 6 July 1918, two weeks shy of his thirty-ninth birthday. John P. Mitchel is less well known than figures like Jimmy Walker and Fiorello La Guardia, but New York’s “Boy Mayor” embodied his time in office just as much as his two successors personified the period of the Roaring Twenties through the end of the Second World War. 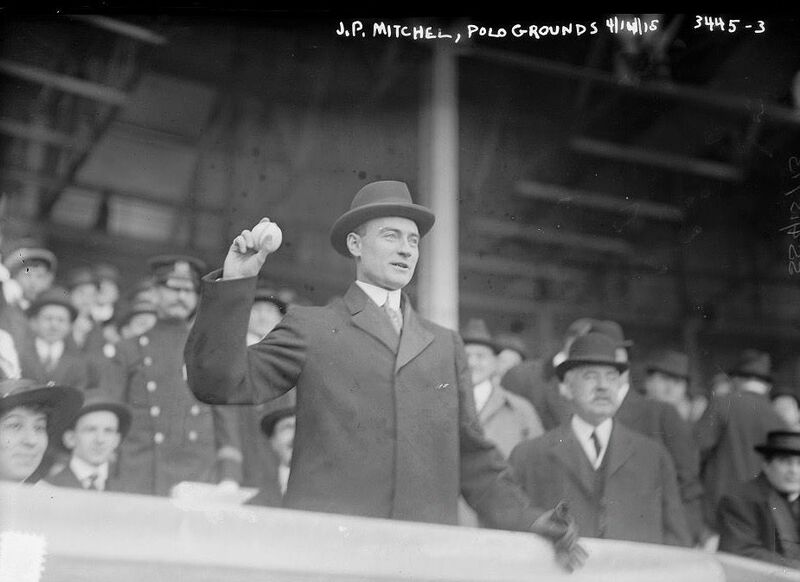 John Purroy Mitchel, was born in the Bronx in 1879. Young John graduated from St. John’s College (today Fordham Preparatory School) in 1894, earned his bachelor’s degree at Columbia College in 1899, and graduated with honors from New York Law school in 1901. He quickly rose in politics, earning a reputation as an idealistic reformer unafraid to take on Tammany Hall. In the 1900s he helped Mayor George B. McClellan Jr. weed out corruption and held increasingly important posts into the 1910s. In 1913 Woodrow Wilson nominated Mitchel for the Collectorship of the Port of New York. He served in that capacity for about five months until stepping down with Wilson’s blessing to run for mayor. Mitchel ran on the Fusion ticket and was a popular candidate who drew support from such powerful sources as Wilson and Theodore Roosevelt. John Purroy Mitchel won in a landslide and at thirty-four became second youngest mayor of New York City. Mitchel pursued his reformist agenda but things changed suddenly when the war broke out in Europe. After the sinking of the Lusitania in May 1915 Mayor Mitchel became a greater advocate for Preparedness and attended the Plattsburg Camp that August. He and other civilians, including some of Roosevelt’s sons, paid their own way to march, drill, and study the rudiments of military tactics. There was national controversy that August when Theodore Roosevelt showed up and gave a fiery speech denouncing the Wilson Administration and what he viewed as its do-nothing response to the Great War. Roosevelt, Leonard Wood, Mitchel, and others, primarily successful Northeasterners, continued strenuously advocating for Preparedness into 1916 all the way up until America’s declaration of war in April 1917. That November Mayor Mitchel ran for re-election. While he retained the strong public support of prominent figures like Theodore Roosevelt and former Supreme Court justice Charles Evans Hughes, he nonetheless lost the race. Mitchel did not remain in New York very long. The very day he lost his re-election bid he had begun corresponding with Secretary of War Newton Baker, seeking an officer’s billet in the infantry. Baker remained noncommittal even after a face-to-face meeting in Washington later that month. Mitchel also pleaded his case to President Wilson’s most trusted advisor, Colonel House, but he too rebuffed the overtures. Baker and House’s reluctance should not be surprising. 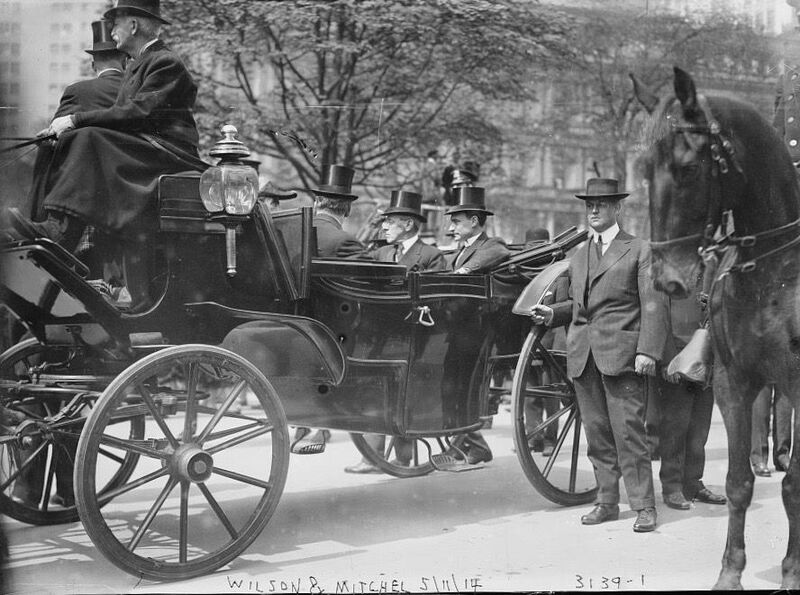 Mitchel had been a Wilson ally in the Administration’s early days. A rift was inevitable though once the mayor began attacking the Wilson Administration over its Preparedness stance. The determined Mitchel did eventually find a place for himself in the military, accepting an officer’s commission in the Army Signal Corps’ Division of Military Aeronautics in early January 1918. In mid-February Major John P. Mitchel boarded a train at Grand Central Station headed for San Diego with his wife. For the next two months the former mayor of New York City would learn to fly various small planes and was soon performing barrel rolls and other maneuvers. Mitchel was next ordered to Gerstner Field near Lake Charles, Louisiana. It was tough duty. The base was remote and the Louisiana summer heat oppressive. Still Mayor and Mrs. Mitchel made the best of the difficult situation. Things were going routinely until a training exercise on 6 July. His instructor remembered that Mitchel did a few basic maneuvers until losing control of the small aircraft. Then, he saw Mitchel tumble from the plane. Investigators later determined that he was not strapped in to the seat belt. Death was instantaneous. 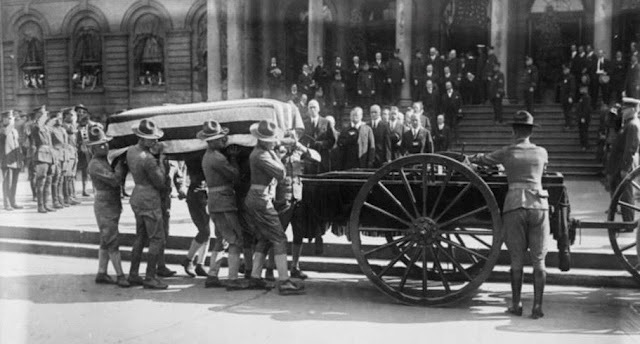 Mitchel was given a funeral with full military honors in New York City on 11 July. When St. Francis Xavier, of which Mitchel was a member, proved too small to accommodate the growing number of mourners, the funeral was moved to St. Patrick’s Cathedral. An airplane dropped roses from above. There in support was former president Theodore Roosevelt, who after his friend’s death had written to the now-widowed Mrs. Mitchel that “In all our country there was no finer American and no more upright and able public servant.” Some speculated in those July days that had Mitchel survived he might have gone on to win the the presidency some day. Mitchel was buried in Woodlawn Cemetery in the Bronx. Soon the commemorations began. The military aviation base in Long Island was renamed Mitchel Field that very week. On Alumni Day 1921 Columbia’s Class of 1899 dedicated a tablet to Mitchel in Hamilton Hall. That July the New York City Fire Department christened the “John Purroy Mitchel,” the first-ever oil-fueled fire-boat in the line. New York’s waterways were still thriving in this era. Its harbors were constantly active and ocean liners crossed the Atlantic daily pulling into its piers. In the ensuing decades the fire-boat put down some of the most intense conflagrations in New York maritime history. In 1928 admirers dedicated a John P. Mitchel Memorial in Central Park near the 90th Street and Fifth Avenue entrance. Mayor La Guardia attended Memorial Day services there annually throughout the 1930s and 1940s, rarely missing a ceremony. The New York Public Library dedicated two flagpoles to the memory of Mayor Mitchel in 1941 outside its iconic 42nd Street branch. These observances tapered off in the 1950s as the Great War began receding from memory into history. In 1966 the Fire Department retired the “John Purroy Mitchel” after the fire-boat's more than four decades of hard service. The Uniformed Firemen’s Association and other advocates issued a protest but eventually accepted the inevitable. Sadly John Purroy Mitchel became increasingly forgotten over the following years. Not even yet forty when he died, the Boy Mayor may have gone on to take the White House, perhaps becoming the first Catholic to assume the presidency decades before John F. Kennedy. Keith Muchowski, a librarian and professor at New York City College of Technology (CUNY) in Brooklyn NY, writes occasionally for Roads to the Great War. He blogs at thestrawfoot.com. Why Is An American General's Statue in Budapest? What Happened at Death Valley?